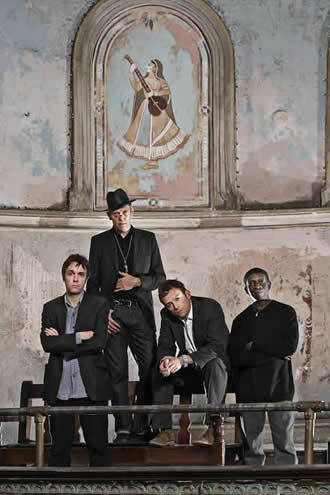 The Good, The Bad & The Queen project started when, as a young boy, Damon Albarn (Blur, Gorillaz) would listen to The Specials’ Ghost Town and The Clash’s Rock The Casbah and say, “I want to make music like that!” It was the originality, colour and theatricality that appealed. On the last Blur record, Music is My Radar, there’s a lyric by Albarn that goes, “Tony Allen got me dancing”, Allen being the drummer with Fela Kuti, composer and songwriter, pioneer of Afrobeat, in the mid-60s. Damon and guitarist Simon Tong (The Verve, Blur and Gorillaz) went to Nigeria to record with Allen and other Nigerian artists. But the result, apart from one track on this album, Behind The Sun, never saw the light of day. In April 2005, former Clash bassist Paul Simonon was asked to join the project. Both Albarn and Simonon being passionate West London, Ladbroke Grove boys, had read Peter Ackroyd’s Biography of London and passed other books on London to and fro between each other. Simonon says making the album was an enjoyable experience. Albarn organised the troops, bringing songs in each day to try, which they would just get stuck in to rehearsing in a different, more organised way to his Clash days. Making up the last member of this elite 5- a-side team, Damon retained the services of brilliant New York producer Brian Burton, a.k.a Danger Mouse (Gnarls Barkley band member and producer of legendary illegal mash up - The Grey Album - The Beatles White Album mixed together with Jay-Z’s Black Album). He had produced Gorillaz’s Demon Days LP and is, incidentally, the hottest producer on the planet. The LP, a long time in the making, is worth the wait. Albarn has been able to move on from past recordings to find new ways to express himself musically. Of course the players he has by his side help in no small measure. This is an album about “a stroppy little island of mixed up people” and more specifically London, its past and present. The haunting beauty of The Bunting Song (dreamy strange phenomena out in the country) or A Soldier’s Tale can bring a tear to the eye. Or there’s the odd, moving romance of The Whale Song for Albarn’s partner. His voice has never sounded in such good fettle, here or elsewhere - the high notes make highlights in some choruses. The album, of course, coming from Albarn, is in moments a political statement full of worry. Anglo-Saxon Friday night drinking rituals feature on Kingdom of Doom, the lyrics summing up an anti-Iraq war nation, “drink all day, ‘cause the country’s at war” while further anti-war sentiment coupled with happy memories of days gone by are heard in 80’s Life. Nature Springs condemns us to a loss of identity, becoming second-hand America. Albarn comments: “We’ve lost our values and replaced them with hamburgers.”“Emptiness in computers bothers me”, “war and the tidal wave” and “we saw the green fields turn into stone”, are all individual lyrics that crop up in different songs, highlighting concerns in his psyche at present. Every track on the LP is an individual piece of work, yet all are comfortable alongside each other, happy relations amongst the echoic dub they are wrapped in. The band’s sheer craft of musicianship provides endless beauty, creating a multi- layered LP to return to over the years. Perhaps, dare I say it; this is Albarn’s OK Computer. Danger Mouse turns in a master class in production, with his use of electronica showcasing his amazing ear for sound once again. Right at the end, the title track cranks it up for a big vaudevillian 60s style finale. As Tong says “it’s the only jam on the album”, finishing it all on a high. Albarn’s lyrics say that we have our problems in Britain, but it’ll all get sorted, the kids are alright. It reminds me of The Kinks shape shifting classic Shangri-la. Some way indeed to bring down the curtain.